Emotions are running high this election season and investors are nervous about how the election will affect their investments. Tumultuous events have been a constant theme for presidential elections throughout history. 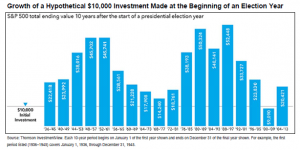 In 17 of 18 past presidential elections, a hypothetical $10,000 investment in the S&P 500 made at the beginning of each election year would have gained value 10 years later. Long-term investment success has depended more on the strength of the US economy than on which party occupies the White House during any particular four-year period. Beliefs about which political party is best for the markets may encourage you to vote, but shouldn’t discourage you from investing.